Every year during our annual holidays in Ireland, my husband Paul and I set ourselves a target or a mission: we follow the trail of a well-known Irish person. In the past years we have done the Michael Collins’ trail (Co. Cork and Dublin), we have followed the poet William Butler Yeats (Co. Sligo and Dublin), the Irish writers James Joyce (Dublin and surroundings) and Oscar Wilde (Dublin, Co. Galway, Co. Longford), and last year we went to Edgeworthstown, the hometown of Maria Edgeworth (and visited her grave). It is usually more my personal mission than Paul’s because of the literary, historical and cultural interest I have in Ireland. Each year we also try and find “Brontë” links in Ireland, we even found a shop called “Brontë” in Carrigaline (Co. Cork), selling shoes of all things! 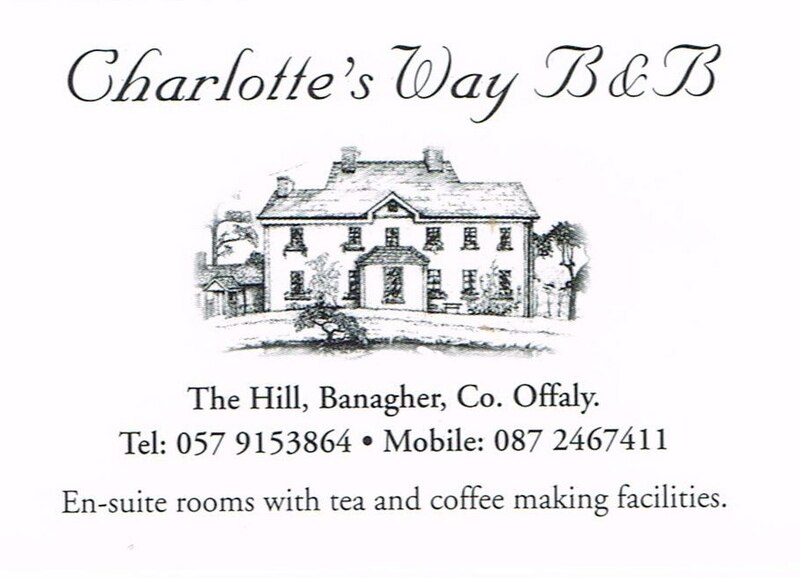 This year my mission was really Brontë-related: a visit to Banagher (Co. Offaly) to trace the Irish roots of Charlotte’s husband Arthur Bell Nicholls. The day of this mission was to be Saturday 20 July 2013, when we were travelling from Boyle (Co. Roscommon) to Dun Laoghaire (Co. Dublin) on our way back home. We planned to make a small detour to Banagher, the village where Arthur Bell Nicholls returned to after the death of Rev. Patrick Brontë, the town where he had spent most of his childhood and where some of his relatives still lived at that time. 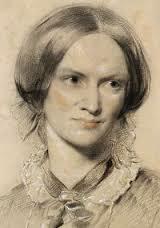 As I already said, it had become more my personal mission , especially since I had read the book “ Mr Charlotte Brontë”. Paul is not so interested in literature and the Brontës but he was quite willing to drive me all the way to Banagher, because the town is situated in beautiful surroundings (we have been in the area before, though not in Banagher itself). I was very excited about the whole expedition. And the nearer we got to Banagher, the more excited I became. Finally I saw the sign indicating that we entered Banagher. Now, we had to locate the churchyard where Arthur was buried and the house where he had spent the last years of his life. As a way of preparing myself for this mission, I had just finished reading the book “My dear boy” , telling the story of Arthur’s life. I knew from that book that the house and the church were “at the top of the hill”. 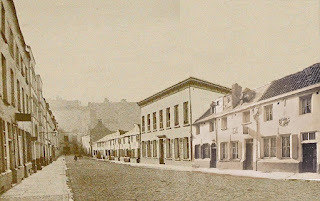 When entering the centre of Banagher there was a road going uphill. We took this road and noticed there was more than one church along that road (which seemed to be the main street), but at the top we saw a church spire and we were convinced that this was the church we were looking for. At the top of the hill (called appropriately “The Hill”) we found a beautiful old church surrounded by an old graveyard and a stone wall, which was indeed St Paul’s Church of Ireland (mentioned in the book). However, there was one big problem: the gate was closed and there was no other way of entering the churchyard (climbing over the gate and the wall was certainly not an option!!). In vain we tried to call the rector whose telephone number was mentioned on the board at the entrance. I then went to one of the neighbouring houses to ask whether they knew who was in charge of the key, but although they were very helpful, they could not get hold of the person responsible. Apparently, at that particular moment there was a funeral of a young local man going on in one of the other churches and everybody in town seemed to be at that funeral. I was referred to the house known as “Hill House” where perhaps they might be able to help me further. I was very excited because that was in fact the house where Arthur lived with his second wife and where he died. Following the directions and description I was given, I finally found the house in question (located on the same road very near to the church). Charlotte showed me the way! 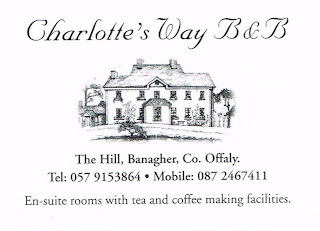 The house at “The Hill” was known in Arthur’s day as “the Hill House”, now it was a B&B and renamed “Charlotte’s way” (I noticed the sign at the entrance). I really would not have recognized the house from the pictures I had seen in “My dear boy”: it was a beautiful yellow-painted house with a beautiful porch entrance, and a paddock in front where 2 ponies ran around, flowers everywhere. I was so thrilled to be there! I saw a man coming out of the house and explained the situation. I asked him whether he could help me locate the person in charge of the churchyard key. His name was John Daly and his daughter owned the house. He told me that up to six months ago he would have been able to help me with the key, but since the church had been vandalized six months ago (and nearly burned down) the gate was kept closed at all times (except Sunday church service). He would try to sort this out, in the mean time I could go in the house to meet his daughter Nikki. I just could not believe my (Irish) luck: was this a fairytale? Was I dreaming in broad daylight? In the house I met Nikki, who gave me a very warm welcome (the Irish way). She showed me around the ground floor pointing out a few items of interest related to Charlotte : a portrait of Charlotte painted by a friend artist based on the Richmond portrait, the crest of the house, a copy of the pillar portrait of the Brontës (the original was found in the attic of Hill House after Arthur’s death) which had a very prominent place in the sitting room, the room where Arthur ‘s body was laid before his burial. I was allowed to browse around on my own in all the rooms of the house and I could even take pictures. I really could not believe it. I really thought I was dreaming. Hill House, now “Charlotte’s way B&B”, is a beautiful Georgian house (17th century), lovingly refurbished inside to modern standards but keeping the spirit of the house intact. It made a wonderful impression upon me. The ground floor contains a small sitting room, the dining room with annexed a large sitting room (where the portrait of the 3 sisters is exhibited), the hall (with Charlotte’s portrait and the crest of Charlotte’s Way) and the kitchen. A beautiful staircase (though not the original staircase which Arthur would have known) leads us to the first floor where there are 4 bedrooms. One of these bedrooms was Arthur’s room, another bedroom was the room in which Charlotte had tea when she visited the house and the family on their honeymoon. At the top of the staircase (the former attic) there is one more bedroom. The basement was converted to a storeroom and a bedroom with a large window opening up to the garden in the back. While I was browsing around the house Paul came back to let me know that (by coincidence?) someone had turned up at the church gate with the key and was waiting for me to show me around the graveyard and the church. Finally, my mission could be completed: I was going to see the grave of Arthur Bell Nicholls and his second wife Mary Anna (née Bell). Mrs Fay Clarke, church warden of St Paul’s church, was indeed waiting for us at the gate. She brought us straight to the graves of the Bell family. Arthur’s grave was the grave at the right hand side of the plot. I had brought a pot of lavender with me and on behalf of the Brussels Brontë Group I put it on Arthur’s grave together with a poem of Charlotte (“Memory”) and some Connemara pebble stones. I held a moment of silence in memory of Arthur Bell Nicholls and his second wife, and in memory of the whole Brontë family. For me this was a very emotional moment! Then we went inside the church, such a quiet and peaceful place! There was a beautiful stained glass window dedicated to the Bell family of Cuba House (where Arthur grew up with his uncle, aunt and cousins) . Fay told us that Cuba House was demolished many years ago (in the 1980’s). What a shame! And the same could have happened to this beautiful old church: Imagine that all this could have been destroyed by fire six months ago, if the vandals had had their way!!!! Luckily there was an alert fireman staying in Charlotte’s Way who heard the noise and reacted immediately. The church was badly damaged, but saved. The vandals were prosecuted. We thanked Fay for taking the time to show us around the graveyard and the church. I really was very grateful that I was given this opportunity. It really was my lucky day! We returned to Hill House (Charlotte’s Way) where we were invited for coffee/tea in the garden. The landlady Nikki proved to be very passionate about the house. She knew and loved the house from her childhood, because her mother was a housekeeper there. When the house came up for sale, she jumped at the opportunity . She is a nurse and initially it was her intention to turn the house into a nursing home, but it proved to be an impossible task to comply with all the requirements needed for a nursing home (e.g. lift). So she turned it into a B&B. She is running the place on her own, but she said she never feels alone in the house because there are so many good spirits still present in the house. 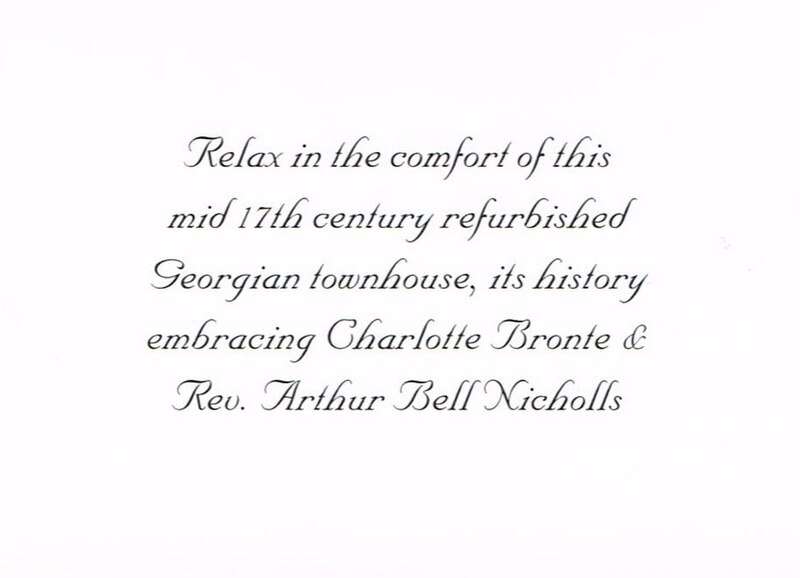 The house is steeped in history, and breathes warmth and hospitality, …….. and Brontës! 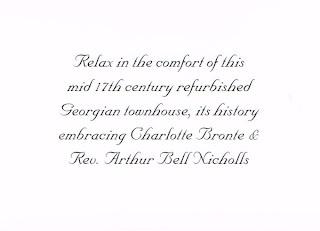 She has been writing a book on the history of the house, which will be published in the near future. I’m really looking forward to reading it. During our chat in the garden (it was such a lovely warm and sunny day) Nikki told us that she had many English fishermen staying in the house at regular times (the region is a well-known fishing spot), but that she wanted to emphasize the Brontë-link of the house a little bit more in future. She was planning to visit Haworth in the autumn this year. The fishing link got Paul interested in the house, and he got talking to Nikki about all angling events in the area. 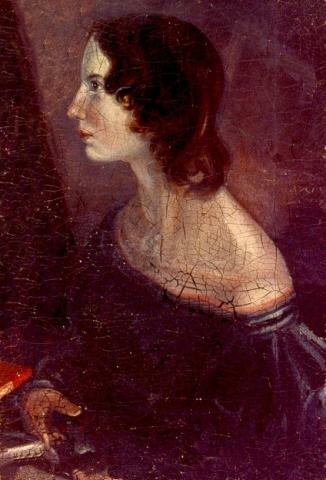 So who knows, one day soon we might come back here to stay: angling and Brontës – a perfect combination for us! We said goodbye to Nikki and John and thanked them for the warm welcome and hospitality we received. 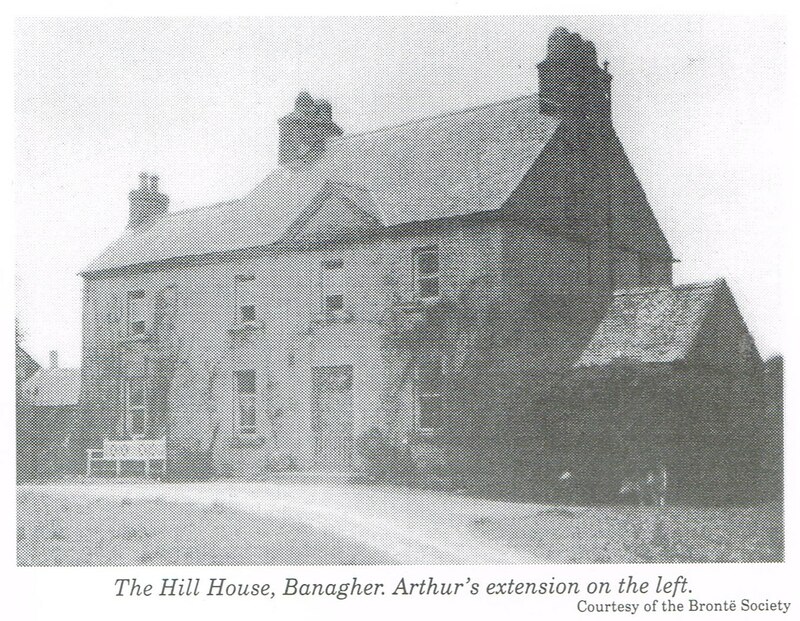 A last picture from me in front of the house was taken, and then we left Hill House….. and Banagher. I really believe this was my very lucky day: I could not have been happier and I think my face must have shown a smile all the time. It was wonderful that everything turned out so well in the end. Not only did I reach my initial target (visiting the grave of Arthur Bell Nicholls) but I got more than I expected (a visit to Hill House). My personal mission was accomplished! But since there is so much more to explore in Banagher (and surroundings) I’m sure we will be back here, rather sooner than later!